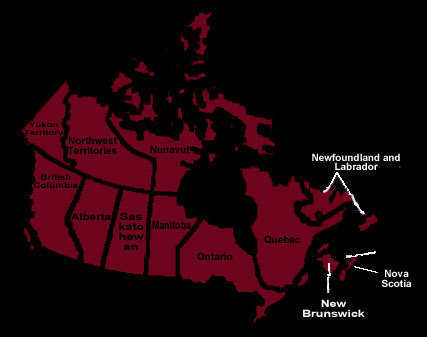 Canada Strippers - Click on your province! Specializing in Bachelor and Bachelorette & Birthday Parties all across Canada. Canada Male Strippers are avaiiable in most provinces nationwide. A majority of the dancers are based in the larger, metropolitan areas and then have to drive to get to more remote areas. For any parties that are far from a major city, we suggest inquiring and booking your party way in advance about three to four weeks minimum. If you are looking to have two dancers at the same time, be sure you have at least 25 or more girls attending. Dancer work on tips and if we send out two guys to a party of six girls, the dancers end up fighting over a small amount of tips. Female Strippers in Canada are popular for stag parties and birthdays. We always recommend booking at least two girls for your upcoming guys night out. If you want the bachelor to be totally shocked, and extremely excited, do not hold back and go with at least a two girl show. Again, all dancers work on tips, so be sure everyone is prepared before the girls arrive. The last thing you want to happen is for strippers to show up and then when the show is in progress, everyone is staring at each other with no money. That is embarassing and also frustrates the dancers after they have made a very big effort to travel to your location to do your party. Keep in mind during the winter months, some rural areas might be hard to get to or impossible to service. As a company, we try to book every possible party we get a call for, however safety is number one. If it is too dangerous of an area involved with severe snow storms or ice, we may not be able to service certain areas in the winter months. Always hiring experienced female and male strippers.